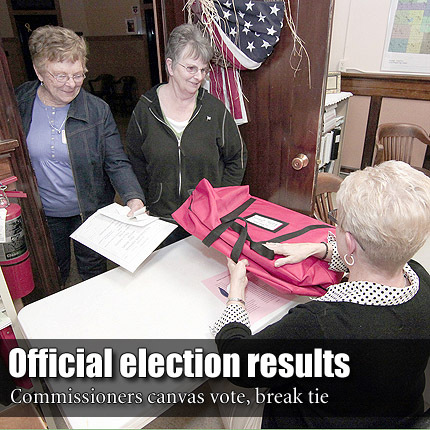 LYNDON—The Osage County Commissioners canvassed provisional ballots at their regular meeting Monday morning. Two tight races in Osage City awaited the canvassing results. After election night, the race for the city council seat in ward one was tied between Denise Lauber and Ricky Martin. In city council seat Ward two, only two votes separated Michael Handly and Robert Rowe. Commissioners went through guidelines, set out by the state, to determine whether provisional ballots could be tallied for the April 2 election. Many of the ballots that were ineligible to be counted were thrown out because they were not registered in Osage County, they failed to sign the envelope for advanced ballot, or the voter did not bring ID to the polling place. If a voter forgot ID, they were given until 8:30 a.m. Monday to bring ID by the county clerk’s office. After going through all the provisional ballots, commissioners found 12 acceptable ballots and one partial ballot to add to election results. The partial ballot was due to a person voting at the wrong polling place in Osage City. Commissioners were able to count the part of the ballot that was not specific to his/her address. The extra ballots did not affect the outcome of either Osage County race and the race for ward one stayed deadlocked at 70 votes apiece. Lauber and Martin had been informed that if they stayed tied, the tie would be broken at 10:30 Monday morning at the commission meeting. Martin could not be at the meeting, but Lauber was present and called the coin toss. The coin landed heads up, giving the race to Ricky Martin. Before she left, county commissioner Ken Kuykendall thanked Lauber for running.